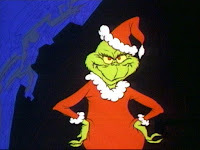 Similar to the Grinch's heart being three sizes too small, would it help those who live in grinchy isolation to speak with a therapist? The problem is, we and the Grinch like where we are. "Atheist" is a crowded word. It could include all who reject any form of theism on philosophical grounds and/or those who reject religion because of the bad behavior of its adherents. When it comes to what people believe or don't, frankly only God knows if what we say and what we really think are remotely similar. Many Americans subscribe to what I would call functional atheism, that is, there has been and continues to be a gap between what we say we believe (78% belief in God) and actual religious participation and practice (54% say religion very important in life). For Americans, especially UMC's, we know the "right" (read: popular or majority) answers so the presence of the cheat scale is real. But I wonder if the gap is explained away just by fudging the questions. In one video our kids enjoyed years ago, the Grinch is psychoanalyzed by none other than the Cat in the Hat. What prompts him to do and persist in doing such mean things? In a similar fashion, it might be helpful to assume that absolutely everyone who walks into our lives is a wounded individual, with or without church affiliation. And the wounded wound.